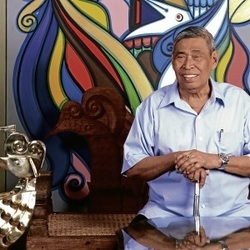 Abdulmari Asia Imao, born on the 14th of January 1936 in Jolo, Sulu is the first Moro, and the only one to date, to be honored as National Artist of the Philippines. Named National Artist for Sculpture in 2006, he articulates Philippine Muslim art and culture through his work not only as a sculptor but also as a painter, photographer, ceramist, documentary film maker, cultural researcher, and writer. A native of Sulu, he obtained his Bachelor of Fine Arts in Sculpture from the University of the Philippines in Diliman, Quezon City. At U.P. he was introduced to and mentored by Filipino masters like Guillermo Tolentino and Napoleon Abueva (and who precede him as National Artists). He earned his Master of Fine Arts in Sculpture from the University of Kansas, USA in 1962 as a Smith Mundt and Fulbright Scholar. He also did advanced studies in sculpture and ceramics as Fellow at the Rhode Island School of Design, 1961-1962 and in brass-casting and photography as a Faculty Scholar at the Columbia University in New York City, 1962-1963. Imao also has the distinction of being the first Asian recipient of the New York Museum of Modern Art Grant to Europe and Scandinavia in 1963. 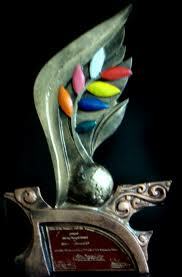 Among his major works are the Industry Brass Mural, Philippine National Bank, San Fernando, La Union; Mural Relief on Filmmaking, Manila City Hall; Industrial Mural, Central Bank of the Philippines, San Fernando, La Union; and Sulu Warriors (statues of Panglima Unaid and Captain Abdurahim Imao), Sulu Provincial Capitol.